This is my first horse card of 2013. I make them for my sister, the equine surgeon, to give to her friends and clients. This image is from Coronado Island, the sentiment is from Door County Rubber Stamps. To create the background, I started with 5 different blue Copics. With the darkest, I coloured a line about 1/2 inch thick, and went over it more times near the bottom than the top. I worked my way up, using a lighter colour each time, and overlapping with the colour below. At the end, I used my lightest shade and went over the whole thing until it was translucent, it was so wet. Once dried, it turned into this beautifully blended sky. I simply stamped the image in black and then put the card together. You may have noticed that I have customers with unique needs - between the bells and the horses and Christmas cards for 2 church congregations this year, I think I'll have no problem keeping myself busy and out of trouble! Wow! this is beautiful...love the amazing inking. Your background is absolutely perfect to highlight that gorgeous stamp! Really, your background is with Copics?! Bravo! With all the things I've used markers on, I never thought to use it on the whole background. Thanks for ANOTHER great idea, Ardyth!! Yea! A horse! And it is, of course, beautiful! Stunning card Ardyth! Love it! This horse card is magnificent! Such a bold image. I love how you made the graduated sky. Great tip! What a stunning background! The Copic technique is brilliant!!! Love this! I love the background and the horse stamp! It just says freedom! Amazing job with the Copics! Wow....I have tried this and never, EVER had results like this! The image looks stunning against this background. What type of paper did you use? 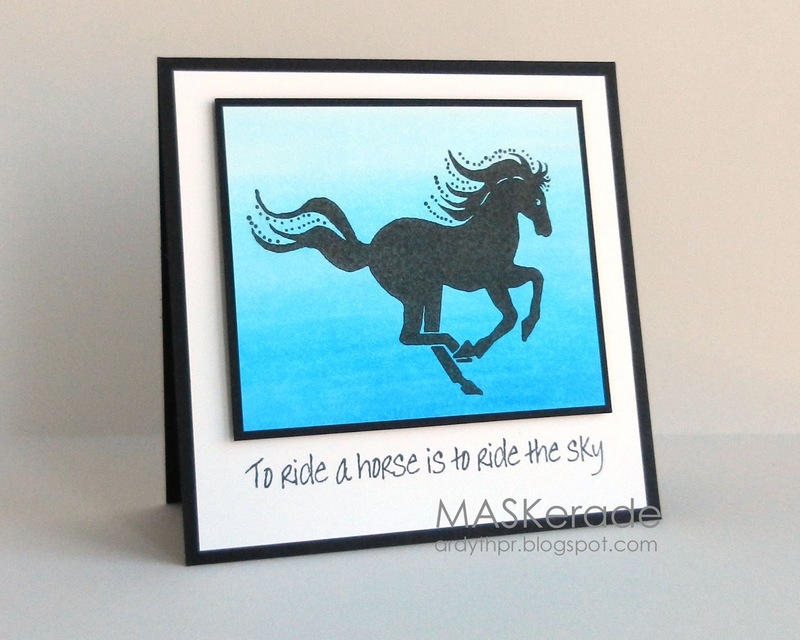 From this horse-lover's point of view - this card is fabulous!! I love the image, the graduated color, and especially the sentiment! WOW!!! Stunning! I love the silhouette image of the horse. very pretty! Love the blue ombre!